There are a million burgers in Manhattan (plus or minus a few, if you want to be nitpicky about it), and, because it's our job, we've eaten a lot of them... enough that we could honestly put together a guide to the best burger spot in every Manhattan neighborhood if we wanted to. 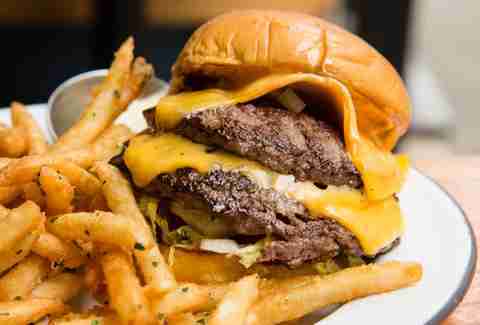 Well... turns out we wanted to: Here are the best burger places in 29 Manhattan 'hoods, so you can finally stop wading aimlessly through NYC's juicy, cheesy burger waters. Nothing fancy here, unless you decide to spring for additions like avocado, but why would you want to? The Bacon Royale already has everything you want in a burger: perfectly cooked patty, flows of melty cheese (get American), crisp strips of bacon, and a generous helping of pickles, all on a pillowy brioche bun. The arrival of this cult-favorite California-born chain at Brookfield Place totally transformed the practically nonexistent burger scene in Battery Park. There are plenty of extravagances here, like the Hatch Burger with Hatch chilies, garlic aioli, and a queso-like cheese sauce, or the Truffle Burger, which is pretty much truffle everything. The burger at this laid-back bar specializing in beer-and-shot combos kind of sneaks up on you. The juicy patty, squishy Martin’s roll, and optional cheese and bacon make it a very good bar burger, but it’s Jeepney chef Miguel Trinidad’s additions of atchara (Filipino pickled vegetables) and fig aioli that make it truly special. 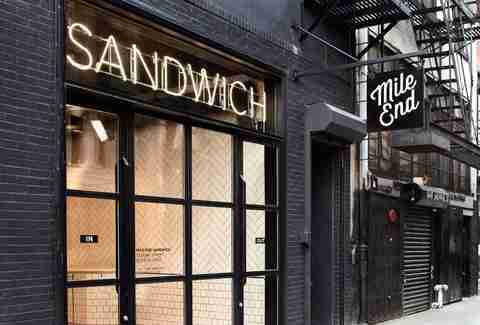 Whitmans originated in the East Village, and its new Hudson Yards branch is great news for the neighborhood. It’s one of the few places in the city making a real-deal Jucy Lucy, which, for the uninitiated, is basically an inside-out cheeseburger, featuring a patty stuffed with molten cheese (Pimento, in this case). Sloppy, post-bar paradise: That is the Breakroom burger in the best possible way. It’s a beast of a burger, stacked precariously with crispy confit pork belly, onion rings, a drippy fried egg, jalapeños, and American cheese. Sebastian’s Steakhouse Burger (named for the NJ steakhouse that supplies steak trimmings for the patty) offers all the deep, prime beef flavors of a fancy steakhouse burger for the no-so-steakhouse-y price of $17. It’s all about that dry-aged beef blend, which is enriched by the addition of fatty deckle, but a blanket of American cheese and a pile of buttery soft caramelized onions definitely don’t hurt. This restaurant in the Woolworth Building only opened in February, but it’s already beating out the local burger competition with not one but two great burgers. For those who like a fast food-esque burger, there’s the Public Burger with two thin patties, special sauce, slaw, and American on a potato roll. For steakhouse burger aficionados, there’s the plump, dry-aged Private Burger with smoked Cheddar, bread & butter pickles, and special sauce on a big, sesame seed-speckled bun. The cheeseburger at this self-described “California-inspired” restaurant inevitably has overtones of In-N-Out, and that’s not a bad thing. Chef Justin Smillie makes his version fancier with grass-fed beef, avocado, Peppadew peppers, and a fluffy artisanal bun, but also sticks to tradition with melted American and thin double-stacked patties. 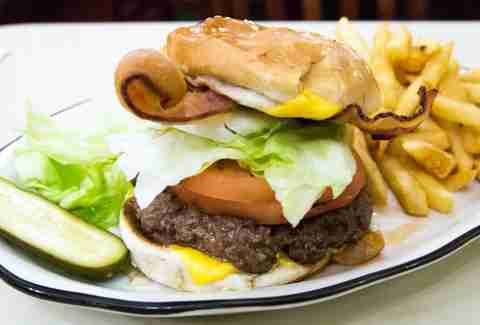 This is the quintessential, no-nonsense diner burger from the quintessential, no-nonsense New York diner. Be sure to request medium-rare, so that it arrives browned and craggy on the outside and juicy on the inside with a little lettuce, onion, tomato, and American. 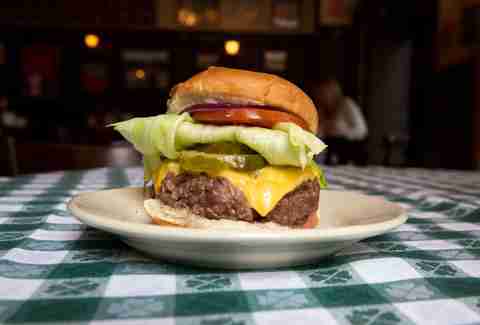 The Black Label burger at Minetta Tavern is the dry-aged burger against which all others are measured. 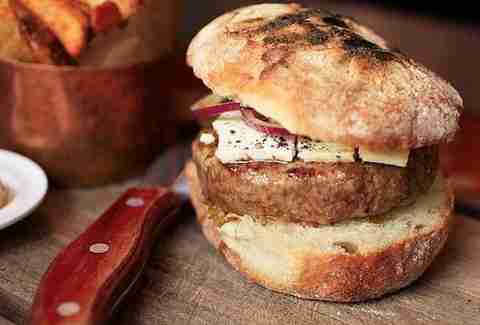 Caramelized onions are all the topping this rich, funky patty of prime beef needs. It’s luxuriously juicy and flavorful and completely worth the $33 price tag, especially when you factor in the pile of perfect shoestring fries. The classic burger here really does the retro diner thing right: it’s smashed and griddled until the edges are crisp, generously dressed with American, pickles, onions, and special sauce, and served on a Martin’s potato roll. Adding pork rinds to the mix, as the Pigskin Classic does, doesn't hurt either. Gotham West Market is packed with so many food options, it’s easy to be overwhelmed. 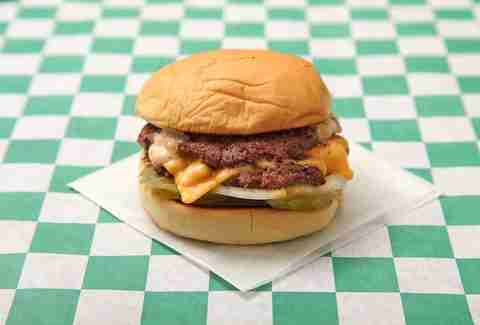 But there’s only one place to get a burger, and a great one at that: Genuine Roadside, where the Super Duper Stack burger combines two smashed patties, American, pickles, and a layer of Thousand Island. In the grand tradition of great, old New York steakhouses (of which Keens is one of the oldest and the greatest), the burger here is as meticulously prepared as the famed mutton chops. The dry-aged patty is thick and ridiculously juicy, served with fat slices of tomato and red onion, an entire half pickle, and cheese if you want it. Like most other steakhouse burgers, this one is only available at the bar or at lunch. Take a great pub burger, make it just a hair fancier, and you’ve got the truffle burger served at this craft beer bar just across from Fort Tryon Park. The thick, beefy patty comes topped with a pile of caramelized onions, a blanket of sweet, pungent Gruyère, and a smear of truffle mayo. 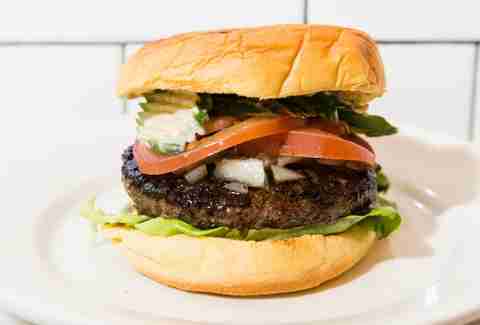 The LES is packed with casual restaurants, so why would you go to a pizza place for a burger? Because Speedy Romeo uses the best elements of its St. Louis-style pizzas for it, that’s why. 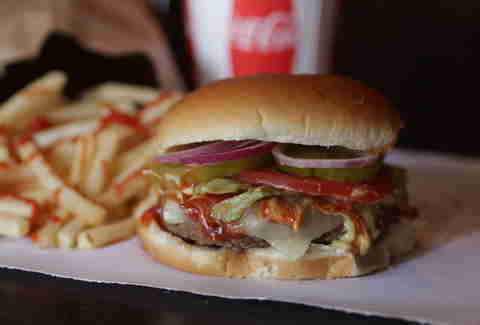 The burger here is thick and juicy, cooked on the wood-fired grill, and topped with two sauces: a thick tomato sauce and an aioli-type “Speedy sauce” along with shredded lettuce and Provel (a melty Midwestern cheese blend). Now that P.J. Clarke’s has multiple locations in and out of NYC, it’s easy to forget that the Third Avenue original is an ancient institution (we’re talking founded in 1884 ancient). But you don’t just go for the history, you go for the Cadillac, the burger christened by jazz legend Nat King Cole for the luxurious way the juicy beef is layered with American cheese and bacon. This not-so-secret secret burger spot, tucked behind a velvet curtain in the Le Parker Meridien hotel, is a New York classic. Get a cheeseburger that combines traditional toppings along with mayo, mustard, ketchup, and pickles for the perfectly messy ideal of a fast food-style burger. Burger toppings gone wild: That’s the MO of this retro-styled bar near Columbia. And on a solid foundation of juicy beef (or turkey or veggie, if that’s your thing) and potato rolls, that makes for great over-the-top burgers like the Dirty Hipster, topped with spinach dip, onion rings, and Jack cheese, or the Widowmaker, piled high with mac & cheese and bacon. This charming Australian cafe does a few great burgers, including an excellent classic American-style option. But if you want to go Aussie, try the Bronte or the Whaleys burger, both of which feature a patty blended with peppers and onions on a ciabatta loaf. The former gets a kick from sweet chili sauce (plus cheese, lettuce, and tomato), while the latter follows the down-under tradition of topping a burger with roasted pineapple, beets, and a fried egg. Lamb burgers don’t always attract as much attention as their beef counterparts, but the one at the Breslin, April Bloomfield’s British gastropub in the Ace Hotel, is an exception: juicy and mildly gamey, perfectly accented by feta and sliced red onion, it could go head to head with its beef brethren any day. This SoHo old-timer used to serve just 12 of its Burger au Poivre a day at the bar, making it the most coveted burger in town. The addition of brunch changed all that, and now the burger is available in unlimited supply every weekend -- but that doesn’t mean it’s any less worth the hype. The fancy French-ish patty has a punchy black pepper crust and comes topped with watercress, red onion, cornichons, and a thick slice of triple creme Saint-André cheese. Leave it to French chef Daniel Boulud to create an indulgent burger with braised short rib, black truffles, and a big hunk of foie gras. When this thing debuted in the early aughts it was a $35 novelty, but it’s withstood the test of time and tastes to become a real classic, and one that’s actually worth the splurge. The burger at American Cut used to be a secret thing, sold in limited quantities and only announced on Twitter. Lucky, it’s now available every night at the bar (and only at the bar). 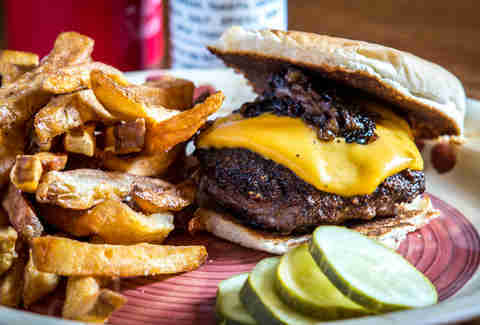 The beef is a rich dry-aged blend, but what really makes it is the addition of onions caramelized in bourbon and oozy beer cheese. The J.G. Melon burger is one of the city’s great simple classics. This cash-only institution works wonders with little more than well-seasoned ground beef, American cheese, and thin-sliced red onion, though you can dress it up with a big mound of crispy bacon if you want. 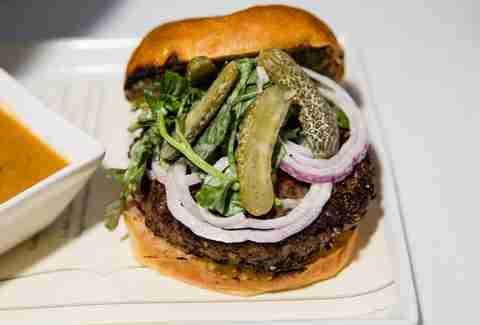 The Ox Burger at the Ribbon is served without a bun, but it’s substantial enough that you won’t mind eating it with a knife and fork. The beef patty instead rests on a buttery piece of toasted challah, and is topped with a poached egg and doused with a stewy oxtail marmalade for a messy meal. This fast-casual burger bar does a solid array of fast food-style burgers in both traditional and not-so-traditional forms. The Heights Burger offers the standard combination of American cheese, L, T, O, and special sauce, but then there are more out-there options like the Wadsworth, topped with ham, pineapple, provolone, and barbecue sauce. 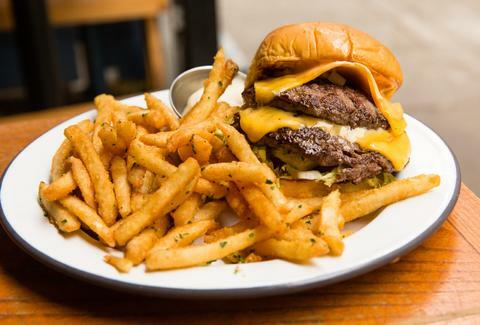 Two things we know for sure: It will always be tough to get a table at April Bloomfield’s OG gastropub/celebrity magnet, and the burger there will always be one of the best in the city. 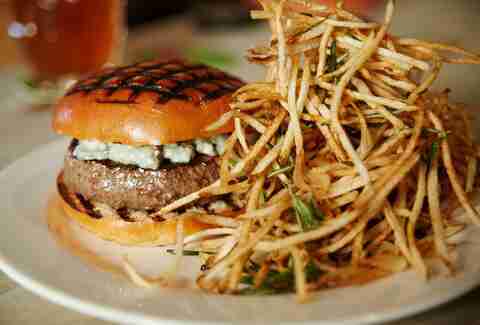 The Roquefort-topped burger, served with a tangle of the thinnest, rosemary-laced shoestring fries, is one for your NYC bucket list. Though if it is too hard to get into the Spotted Pig, badass chef Angie Mar also makes an excellent 45-day dry-aged burger at the nearby Beatrice Inn. 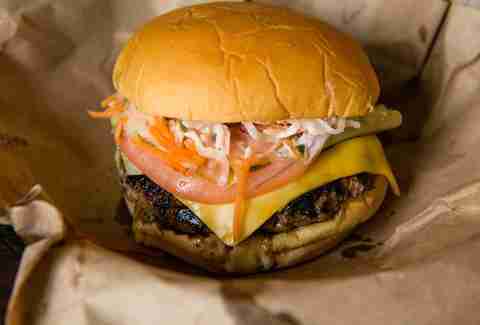 It’s rare to find a $5 burger anywhere outside of fast-food joints, let alone a really good one. So when you find just that at a place like Ethyl’s, do not turn it down. You can bulk it up with $1 and $2 add-ons, or an extra patty, but that basic package of beef, cheese, standard toppings, and special sauce may be all you ever wanted on a night out. Marguerite Preston is a freelance writer based in New York. She thinks American cheese is the best burger cheese.